Last month, I received a copy of Robin Robertson’s newest cookbook, One-Dish Vegan, from the kind folks over at The Harvard Common Press to try out and review here as part of her current blog tour. I am a huge fan of Robin’s cookbooks, and have most of them on my shelf already, so I was especially excited to have her latest release hot off the press. Robin’s unique style is marked by her deft ability to weave ease, convenience and creativity together to design cohesive and completely user-friendly cookbooks, and ODV is no exception. Filled with more than 150 simple, flavorful and quick vegan recipes, her latest release utilizes accessible, nutritious and whole food ingredients to produce dishes that can be made partially or completely ahead of time—making it a perfect guide for those who are striving to eat healthier but don’t have a lot of time of cook. The first recipe I made from ODV was Robin’s Spinach Alfredo Linguine, which uses ingredients like white beans, spinach and mellow miso to create a rich and decadent sauce to drench over linguine noodles. This sauce smells absolutely fantastic while being made and I especially loved its generous hit of garlic and vibrant green color—and leftovers tasted amazing the next day as well. If you’d like to try the recipe out yourself, The Harvard Common Press has kindly agreed to share it here—and if you’d like a chance to win a free copy of the cookbook itself, they are offering one through this blog post! To enter, just leave in the comments section below your favorite one-dish meal and I’ll use random.org to draw the winner on November 17 (shipping restricted to US and Canada only). Good luck! The winner of the giveaway is Shannon, congratulations! This creamy pasta dish features a rich sauce made with fresh spinach and white beans for a nutritious one-dish meal that only tastes indulgent. To make this gluten-free, use gluten-free pasta. Heat the oil or water in a small skillet over medium heat. Add the garlic and cook until softened, about 1 minute. Add the spinach and cook until wilted, 3 minutes. Stir in the beans and broth and season to taste with salt and pepper. Remove from the heat. In a food processor or high-speed blender, combine the spinach mixture, almond milk, lemon juice, nutritional yeast, paprika, basil, and salt and pepper to taste. Process until smooth. Taste and adjust the seasonings if needed. Cook the pasta in a large pot of salted boiling water, stirring occasionally, until it is al dente. Drain well and return to the pot. Pour the sauce over the pasta and toss gently to combine. Serve hot. Love tex mex tofu scrambles with avocado! Thanks for the chance to win! Tofu pot pies! Especially ones that have been pre-assembled and can go in the oven after a long day out. Vegan white bean cassoulet. I'm putting it in the crock pot this morning. Veggi chili is a staple in our house! Quinoa, kale & sweet potato saute! I love making vegan chili. Its so easy and so yummy! Chili , it is easy and delicious! Lentil & rice soup is my standby. Ginger-Sesame Soba noodles – LOVE!! Thanks for the chance to win! Love your blog!! A nice chili all made in one pot has always hit the spot for us. Veggie soup or any kind of soup, especially this time of year. My all time favorite is Stir-fry Green Beans with Tofu, a Asian flair sauce. Curried broccoli and sweet potato soup. Split pea soup! From Robin Robertson's Vegetarian Meat and Potatoes–probably making it this week when the temps drop. This dish looks SO satisfying! I'm a very new vegan who isn't very experienced at cooking so I don't have any vegan one dish meals but my mom used to make this really great chicken pot pie with sage biscuits instead of a crust that was all made in one pan and I'd really like to veganize that once I get a little more familiar with cooking. I love a good lentil stew with spinach. Rice and beans, or just pasta with vegetables ^.^ thanks! I love all kinds of one-dish meal! How about this one: Fusilli with Creamy Summer Vegetable Sauce?! Mmmmm! Roasted veggies with quinoa is definitely my favorite one pot dish! Fried rice with whatever veggies and protein I have on hand! Any stew with curry, cauliflower and green beans! My favorite one dish meal would have to be miso chanko — udon noodles, tofu, and lots of veggies in a miso soup. This spinach lasagna looks like it could be my favorite! Aside from that, I love the Broccoli Bistro Stew from AFR. I love to make a one skillet meal with gnocchi, white beans, swiss chard and tomatoes. mmmmmm…. When it comes to one-dish meals, I am a chili girl through and through. My favorite one-dish vegan meal is Moroccan Lentil Soup with added kale to add extra nutritional punch — thought this spinach alfredo linguine looks like a "must try" recipe! I mix brown rice, edamame, steamed broccoli and wakame with miso-ginger dressing for a quick nutritionally complete & balanced meal. My favorite one pot meal is fried rice, I could eat it everyday. Hummus all blended up in a blender. I am a newbie, so I don't have a favorite dish yet. Just looking for stuff that my picky 11 yr old will like! Split pea soup with barley. Sesame noodles with kale and mushrooms. Mmmmmmmm! I make a great black bean soup, but the recipe is different every time I cook. The only things that are consistent in the recipe are the black beans (well, duh! ), cumin, coriander/cilantro and chili powder. The rest of the soup is made with whatever I have in the fridge or freezer at the time. This is a great way to clean out the fridge just before shopping day! My favorite one dish meal is red curry noodles with lots of veggies. Perfect for this time of year! Veggie chili is my go to; particularly in the Fall/Winter months! Rice is my staple, so vegan fried brown or white rice with marinated tofu and whatever veggies I've got! Super versatile and easy. I discovered your blog just a few months ago but it is already one of my favorite food blogs – thank you for all the lovely ideas and beautiful photos! Any kind of curry…favorite probably has to be the red lentil cauliflower curry from Veganomicon! Love me some Baked Jambalaya (not my own recipe (I do not have those) – but I have no clue where it came from! ): Combine 1/2 cup chopped celery, 2 tbsp chopped green onions, 1/2 tsp thyme, 1 tsp Cajun seasoning, 28 oz can crushed tomatoes, 14.5 oz vegetable broth and 1.5 cups uncooked white rice in a greased 9×13 baking dish. Stir well. Cover and bake for1 hour at 375. Stir well again before serving. YUM!! I love soups and pastas. Right now I've been making a huge pot of pasta fagioli like every week. But I'm excited to see the recipes in this book. Robin Robertson is definitely one of my favorite cookbook authors! Soups of all kind!! I made a vegan tomato soup last night and will be making another vegan soup today which is in my crockpot as I write! I love her books. I have two already! I see that I'm not the only one who loves vegan chili. Nothing like a yummy chili with crusty bread on a cold day. I look forward to seeing this book, and thanks for the opportunity to win it. Mushroom Risotto. The sautéed greens often change depending on what I have on hand but the mushrooms and onion cooked to perfection is what I am really after. My favourite one-pot meal is an "aubergine and tomato pasta" dish… with just a few on-hand ingredients, it couldn't be simpler to make and tastes DIVINE! 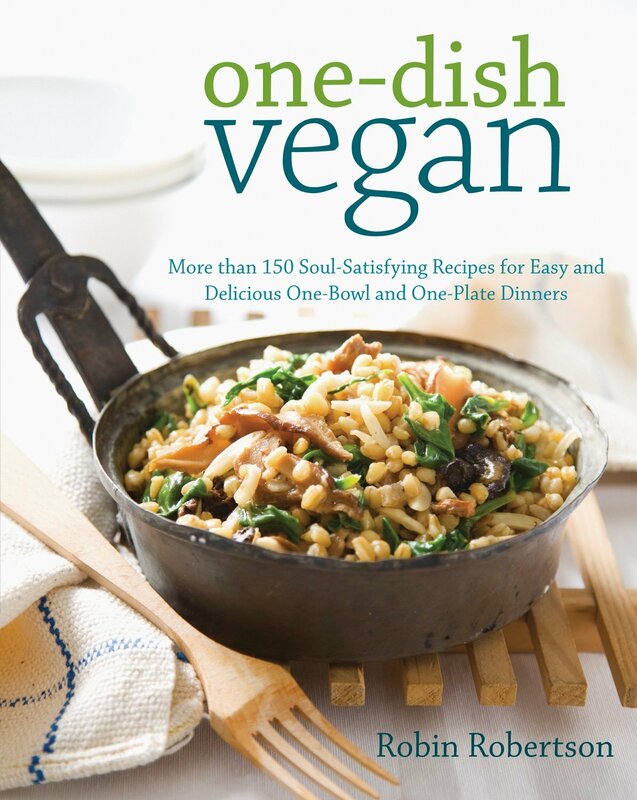 Would love to learn how to prepare other one-pot vegan dishes… thanks for the opportunity to WIN this book! I love to make big pots of veggie soups and stews. I vary them depending what I have on hand. I love Robin's Penne and Butternut Squash with Kale Pesto. It is amazing. Thanks for the chance to win. I would love to have her books. My favorite is the Skillet Lasagna is Robin's book Quick Fix Vegan! Spice lentils are our family winter staple. Thanks for the chance to win. Miso Soup. Hands down winner. Comfort in a giant pot every time, never the same thing twice, and cures all that ails you! Stir fry with (weirdly) field roast! Thanks so much for the giveaway! My fave one dish meal is curry on any kind. YUM! Hearty veggie soup!!! Thank you!! Vegan stir fry, yum I made it this weekend and it is delicious! My favorite one dish meal is a little something I call "Homeburger Helper". Basically noodles, sauce and meat all in one skillet like Hamburger Helper, but made from scratch. I love one-dish meals: chili or a stir-fry/curry are my favorites! Peanut Noodles with broccoli! So easy to cook the noodles in one pan, then add broccoli, drain and mix the sauce right in the pan! There are so MANY that I seldom make the same thing twice! Vegan BBQ white beans with spinach is a great dish to take to a party. Non-vegans like it as much as we do. Thank you for the giveaway! I love one-dish meals; my favorite is (vegan) chili mac. Lentil vegetable soup is one of my favorites, especially in the winter! Indian Dal is my favorite! My favourite one pot dish is definitely Japanese curry. Vegan vegetable curry. But after tyring this recipe, it might be vegan linguine alfredo?? My DIL got me started eating Vegan. Would love to win this for her Birthday. Lentils with greens (kale or collards) and other veggies, like carrots, onions, garlic, mushrooms, tomatoes, and red bell peppers! Whole wheat spaghetti tossed with lots of raw veggies and a peanut/sesame sauce. Mmmm! My favorite one-dish meal is FatFreeVegan's Superfoods Soup, and I add thin rice noodles. It is light and incredibly delicious. Veg pot pie, with either chickpeas or faux chicken and a nice biscuit topping. In fact, I'm having leftovers for lunch today! Red Lentil Soup is one of my favorites. Add kale or spinach to amp up the nutrients! Right now my favorite one-dish meal is chili — so good and warming! The spinach alfredo looks so good. I can't wait to try the recipe. There are so many delicious one-pot meals so I'll go with what's currently on my stove-top: pasta y fagioli. My favorite one-dish dinner lately is root veggie stew, heavy on parsnips, (blended). Love cultured cashew cheese! and many other recipes. Thai curry noodles; love it; thanks! Chili!! Especially this time of year in the North East!! Boston is starting to get chilly!!! Chili-chilly. Lately, I'm loving lentil split pea soup with coconut milk! I love chickpeas with everu veggie I have left sauteed with paprika and olive oil! Trader Joes' 10 minute farro, a scoop of Veggie Better than Bullion, and a handful of dehydrated wild mushrooms… Breakfast/Snack/Lunch/Dinner. Total comfort in a bowl. I'm not vegan, so I love an egg scramble loaded with vegetables and beans. Any kind of soup really. Right now I have a brussel sprout and navy bean soup on the stove. i always try to make everything in one pot as i hate to do the dishes. so i cant say what i love the most…but in wintertime now definetely soups! your recipes are always so beautifully pictured, I love to browse your blog to get inspiration 🙂 keep it up! Chili. Eating some delicious red lentil chili right now. Perfect for the cold weather, too! Definitely going to try that linguine recipe. My go-to one-dish meals are soups and curries. One of my all-time faves… curried butternut squash soup! Veggie Pot Pie is my favorite. My favorite one dish meal is quinoa salad. Oh this looks great – my go-to one pot meal is broccoli with pasta – just saute LOTS of garlic, throw in some pasta, broccoli and a little bit of vinegar – super fast and delish when I'm in a rush! Thanks for hosting the giveaway! I love Sarah Kramer's "Sarah's Green Split Pea Soup" from La Dolce Vegan! Lasagna is my current favorite but that Spinach Alfredo Linguine looks like a future fave for sure. Thanks for the recipe! I did make some subs: didn’t have whole beans so I used some tofu instead, and I only had about half of the spinach required so I threw in som broccoli in the mix and I couldn’t be happier in how lovely this turned out! Thank you so so much for this recipie!